"Capital tends to concentrate in certain areas...and everybody gets their 15-minutes of fame. China basically had it and they ended up with the largest reserves of any country recently...but all these things tend to peak out and then the trend reverses." "(They are now) in an economic decline that will probably not bottom out until around 2020...and just last year up until November the capital flows from China have been over $850 billion, which have left and come over here. So this is part of the issue of keeping the dollar strong; it also helps in perpetuating the trend toward deflation...and the markets are just trying to figure it all out—we're still in this major contraction as capital is trying to figure out which way to go." "Right now, we're probably going to see the bottom in deflation and a lot of commodities in 2016—the market will move back and forth—but the problem with China is that once you start trying to pretend that you can support the market, then you raise unrealistic levels of expectations that the iron fist is more powerful than Adam Smith's invisible hand and, I'm sorry, but Adam Smith always wins. So when people realize that China can't stop a decline, then it's going to go really down—that's the problem with China right now." Armstrong has been a longtime proponent on the importance of tracking global capital flows to understand market behavior. He uses a computer model called Socrates for specific short-term forecasts on various markets and commodities and his longer-term Economic Confidence Model, which is mysteriously based on pi (see Wikipedia entry below the chart), for determining major turning points in global markets. 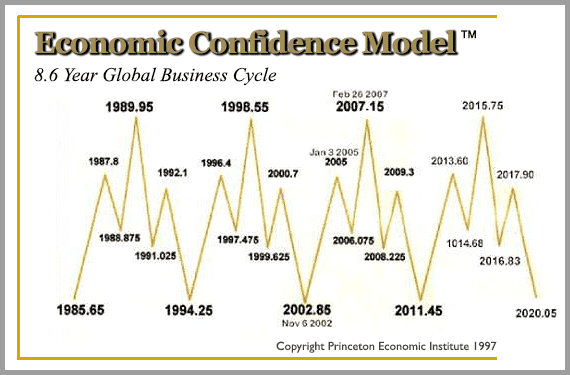 Wikipedia: The Economic Confidence Model is an economic cycle theory by Martin A. Armstrong. Armstrong proposes that economic waves occur every 8.6 years, or 3141 days, which is approximately Pi X 1000. At the end of each cycle is a crisis after which the economic climate improves until the next 8.6 year crisis point. The model has been profiled in The New Yorker, Time magazine, Financial Times and Barron's due to what appeared to be accurate predictions. Many of Armstrong's forecasts and views go against mainstream thinking, as you'll read below, and there was even a highly-praised documentary recently made about him called The Forecaster, which LA Weekly wrote, "convincingly weaves multiple financial collapses, the ouster of Boris Yeltsin and the rise of the Putin oligarchy around Armstrong's life's work — a mathematical model that predicts market peaks and collapses and, allegedly, the wars that accompany both." Click to hear a preview of his recent interview below or scroll down to read more. Armstrong: "The Fed realizes that they have to normalize interest rates—they just have to. If they don't, you're basically going to have a tremendous financial crisis, which I think is coming anyhow and that is largely because most of the pension funds need 8% to make money. You have CalPERS in California which came in at 4.5%. Everybody is below what they need to make to fund pensions globally. You have the same problem in Europe. In Europe you have some countries that actually have regulations that pension funds must buy government bonds by 70 or 80%. Okay, you now lower interest rates to negative. What are you doing?! You're really hurting the economy tremendously and interest rates have to go up. If they don't, we are going to have such a huge economic crisis on the pension side and I think that's going to hit in 2017." "Trump is rising in the polls because everyone knows that something is wrong. If you put in Hillary or you put in Bush, are you really going to get anything changed? I mean, nothing. If it's a career politician, it's the same old story and I'll tell you why—both sides know...Social Security, Medicare, everything goes into deficit starting in 2017. So they are going to continue raising taxes because that's the only thing they know how to do. And the more they raise taxes, the more the economy turns down. They are like a black hole sucking in everything because they do not know how to manage anything." "When people realize—and we're not there yet—but when the vast majority of people begin to realize that the governments are seriously in trouble...then you have a flight of capital away from government bonds and into equities...gold, tangible things—anything of that nature (will rise)..."
Listen to this full interview with Martin Armstrong by logging in and clicking here. For a complete archive of our broadcasts and podcast interviews on finance, economics, and the market, visit our Newshour page here or iTunes page here. Subscribe to our weekly premium podcast by clicking here.